The owners of the Sierijärvi Reindeer Farm live with their reindeer throughout the year, and the reindeer provide their livelihood already for more than 200 years. 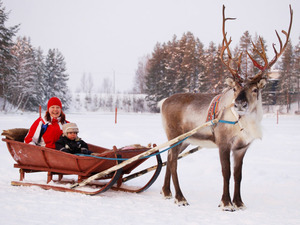 At the Reindeer Farm, the visitor will experience old and new reindeer husbandry culture working hand-in-hand. The visit to the Reindeer Farm includes a tour of the farm, feeding reindeer, and a cup of coffee/tea with sweetbread. Take part in the driving school and earn your own Reindeer Driver’s Licence. After some instruction you will control your own reindeer pulling a sleigh on the specially made route, either alone or with a friend.